Search Get creative with kids! Gruffalo author Julia Donaldson on the best ways to fire children’s imagination. 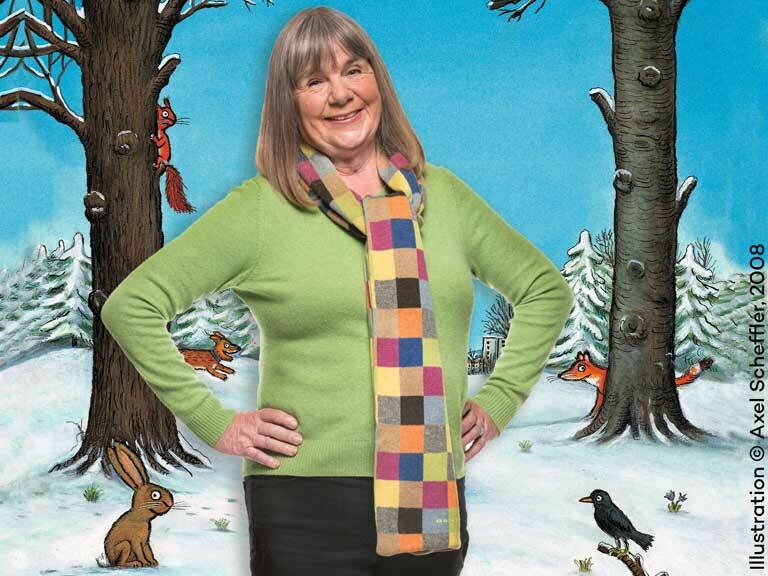 Children’s bookcases across Britain are laden with Julia Donaldson books. The author of The Gruffalo, Stick Man, and some 200 other published works, has sold tens of millions of books, with several titles animated for TV. She’s also a storyteller, performer and songwriter. So who better to give her tips on firing your children or grandchildren’s imagination? My great aunt, a nursery nurse, would often give children just two types of toy to play with. Some farm animals and dinosaurs, say, or a railway set and a doctor’s kit. The idea was that if child has a limited amount of things to focus on, it really stimulates their imagination, rather than them drifting from one toy to another. They’ll also think of interesting ways to combine the two toys. Rather than just playing with the farm animals, as the manufacturer might have intended, for instance, they’ll create some fantasy dramas involving them and the dinosaurs. Puppets and dressing-up clothes are also good, simple playthings to have around. You don’t have to spend much money on them, they can be charity-shop clothes. Being out in nature is more stimulating than indoors, because it’s unpredictable. The weather varies from day to day. You may suddenly see a squirrel or find a weird stick that looks like Stick Man. In fact, I got the idea for Stick Man from my own children – the way they’d use a piece of wood as anything from an ice cream to a violin. When we went out with our children – as we now go out with our grandchildren – if we came to a stream we couldn’t carry on without acting out the Three Billy Goats Gruff. Someone would be the troll and the others would take turns to be the goats. I think when you’re outdoors, you can do this kind of acting and role play. All children I know love Heads, Bodies and Legs, where you draw a head, fold the paper, pass it on to the next person, who then draws a body, then the next person, who draws some legs. Children start thinking of all these weird things like spider bodies, or ballerina legs. Such games don’t cost anything – just slit open an envelope and use that. It could be dance, drama, art… It all depends on what your child is interested in. Don’t send them to too many classes, though. I think sometimes parents are just ferrying their sons or daughters here, there and everywhere, and the children might get a bit blasé before they reach the ideal age to do whatever it is they do. I would say they should attend just one class at a time and mustn’t start too terribly young – unless it’s something like a nature club for tiny tots. Children like drawing, but sometimes might not be very good at it and need guidance. If you aren’t very good at it either, try one of those step-by-step drawing books. I recently got one for my eldest grandson and they’re fun thing to sit and do together, finding out how to draw a knight or a robot, for instance. You don’t want to make children always draw things in the same way, but these books are a good way to start them off. There’s nothing like reading to a child, putting on different voices, getting them to put on funny voices or to act out the role of one of the characters. Take them to the library, because they’ve got boxes of books and you can find out what appeals to your child’s imagination without spending lots of money. One of mine loved the humour of Winnie the Pooh. Another was quite soulful and adored Oscar Wilde’s The Selfish Giant, even if it made him cry. Children are often interested in going to any museum. Sometimes it’s just the building itself that appeals, or maybe there are just one or two exhibits they like. You don’t have to drag the children round for ages. I went to the National Gallery a lot with my aunt and uncle when I was a child. It wasn’t just the pictures I enjoyed, there was a wonderful 17th-century box where you peered through a hole to see the rooms inside. These things stay with you. Children are very good at watching films these days – much better than I was. But so much in life is moving very fast, and when you see a picture in an art gallery, you’ve got quite a long time to notice all the details. It really develops your perception. That’s why picture books are good, too. It’s often difficult to make up a cohesive story – I’ve found it hard. One way round this is to start with an existing tale such as the Three Little Pigs, and get children to write a play about it. They can start with a list of characters, with details of what their personalities are like. ‘First little pig = bossy’, say, ‘Second little pig = shy’, ‘Man with straw = mean’. Whatever they decide. Mother pig: Get out of the house, little pigs, it’s time to seek your fortune. First little pig: Right, the others must come with me. I know what’s best. Second little pig: Oh, Mummy, I don’t want to go. Even though it’s a well-known story, depending on the characters, it’ll come out differently every time. I also like the old-fashioned thing of starting with a title [such as Lost in the Snow] and building the story from there. Something I used to like doing at school was ‘The Story of a Penny’. You start with someone buying something with the coin in the sweetshop, say, and then create a little saga about what happened next. The penny was put in the till, then it got given in change to a little girl, then it fell out of her pocket, etc. All children are different and inspired by different things. Maybe they’ll get into reading more or have their imagination fired by going to the theatre. Some might be stimulated by a book of jokes or poems rather than a novel. Many like comics, because you can read them in bite-sized chunks. One of my seven grandchildren told me, ‘Granny I actually prefer the Star Wars catalogue to your latest book. You’ve got to give them the opportunity to be creative, but don’t get het up about it if they’re not. Not every child wants to, just as not all children want to play sport. When I was a little girl, my father had polio and was in a wheelchair. He was very active, but my mother had to spend a lot of time helping him, hauling him in and out of the car. So my sister and I would just play. We loved putting on shows. We had a wind-up gramophone and 78s with Chopin waltzes, and we’d choreograph ballets and invite the neighbours in to watch us. No one told us to do that. The grown-ups weren’t madly trying to get us to be creative. So I think, one tip is just not to try too hard. Possibilities members can win tickets to a matinee of magical children’s favourite, The Gruffalo, in London.